Takayama Historic District (高山の古い町並) is the old Castle Town which still remains many Edo style buildings and one of the most famous spot in Takayama area. Because of those remaining traditional Edo style buildings, the entire area is registered as the Important Preservation Districts for Group of Historic Buildings. 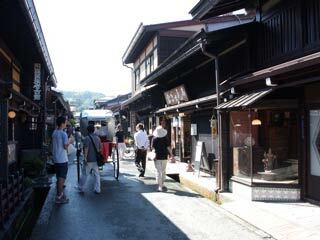 This area was developed as the shopping district of Takayama Castle Town. There are many gift shops, food stands, restaurants, local craft shops, cloth shops, and Sake Breweries. Some of the stores exist since Edo Period. There are the visitor's centers which you can hire English speaking guide. Takayama Historic District consists of Kami-ichi Town, Kami-ni Town and Kami-san Town. The traditional buildings are located on the both side of the Ebhisu street. The channel of the streets and wood-trellis of the buildings are very unique in here. Even the new stores in this area were built in traditional style, therefore the Edo Style atmosphere is well preserved in this shopping district. There are many stores which sale Hida-Takayama local products, such as Sake, Miso, Hida-Beef, and fresh vegetables, local and traditional craft works. There are couples of Sake Breweries in this district. Takayama is popular for its Dry Sake because Takayama get very cold in winter which make Sake very dry. At those breweries, you can enjoy sake tasting. Hida-Beef Sushi is one of the unique delicacy at Takayama.